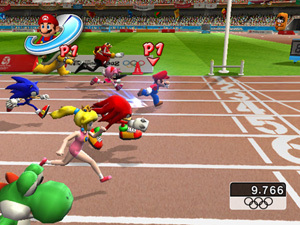 A sports game licensed by the International Olympic Committee for the 2008 Olympic Games in Beijing, and starring characters from the Mario series and Sega's Sonic The Hedgehog series. The game was developed and published by Sega in North America and Europe, while Nintendo published the game in Japan. There are 24 events to take part in and 16 characters to choose from, divided into All-Around, Speed, Power and Skill categories. Players use the Wii Remote and sometimes the Nunchuk to control their character through the event by performing a specified action. Alongside the standard events are Dream Events, based on games in the Mario or Sonic series.